Come away and find a quiet place. Grab a cup of tea. Karelin’s blog inspirations can be found at karelinjames.com. Even in Hawaii, the easing of the heat and humidity is a welcome change. Fall puts me in the mood and frame of mind to get rid of the dead, decaying, no-longer-serving practices. I don’t necessarily want to look for “new” methods. More like, I want to strip away the unnecessary and focus on the core. Even though we don’t enjoy the vibrant color changes of the trees that many places do, I still enjoy looking at the pictures. I began to think about the changes that the trees go through. What is it about dropping leaves that keeps the tree alive through the winter? In the summer, trees are at the height of their growing season. The leaves of the tree are full of chlorophyll and are busy converting sunlight to energy. Food for the tree is produced. The tree “breathes” through its leaves. But as the weather turns cooler, the tree responds by dropping its leaves. God created a plant hormone (abscisic acid) that signals the tree to stop producing leaves and discard the ones it has. The leaves are no longer needed and to keep them on would expend valuable energy. As the tree chokes off the leaves, the chlorophyll dissipates, and the true colors of the leaves show through. Once the leaf is completely dry, it drops. But it is not wasted. Left to decompose on the ground, the leaf’s remaining nutrients can be reclaimed into the soil and give the tree roots insulation from the cold. So many life lessons here. I feel the need to be like an autumn tree. After an intense growing season of this past summer, I could use a season to draw back. I can live off what I learned for a while. I believe that God gives us seasons of life just as the earth experiences them. In some senses, we are evergreens; ready to carry on through the warmth and coolness of the year. My love for my neighbor is an evergreen in my life. But other things, like busy schedules and new endeavors, need time to ebb and flow. I want to slow down and get all I can from the lessons of summer. All that created energy is made to sustain me through the cool season. An interesting fact I learned about dormancy in trees. Forcing a tree to stay green through winter can damage the lifespan of the tree. It is natural for trees to go through dormant stages. Sabbath rest. In our information age, it is possible to force-feed ourselves. I am beginning to see that this is unhealthy for my mind, body, and spirit. It can feel like the more I learn, the less I remember. The more “new” things I try to retain, the more stress I feel. This is what I need in this season. Let me reflect on the things that God has already told me. I don’t need a “new word” from God. I need to pull back and utilize the food of His Word that has already been provided. So how about you? What would it look like to let the summer lessons come in their full colors in your life? What have you recently learned but have yet to slow down and digest? Fall is a beautiful time to do just that. There are days that mark passages of time. Sunday was one of those days in my family. Our first grandchild was presented to the Lord for dedication. Kiele brought her parents, grandparents (me and Mark), godparents, aunts and uncle before the church. Our pastor welcomed Kiele into the fold of believers. She, of course, didn’t understand the pageantry and symbolism but loved all the attention none the less. So much emotion filled my heart. On a personal level, memories of standing in the same spot with my husband came flooding back to me. A quick 23 years ago, we presented Kiele’s mother, Rachael, to the Lord with many of the same saints looking on. God was blatantly showing off His faithfulness. I was overwhelmed. All those years ago, we promised to teach Rachael of the ways of God, that she would be part of the community of God’s family. Most importantly, we promised to seek the Lord’s wisdom and help in raising her. The congregation made a promise that day as well. They promised to support us. They did. Among the crowd were her Sunday school teachers, youth leaders, and mentors. It was just as wonderful for them as it was for her father and me to see those promises fulfilled. Here were Rachael and her husband, bringing their own child and making promises to seek God’s grace on behalf of their daughter. Fill circle. As for sweet Kiele, she has now been pledged to Christ. It is the first step in her journey toward the wedding feast of the Lamb. During a season of personal revival, the idea of a second baptism kept coming back to me. Easter was the time when our church baptized new believers. Since I wasn’t a new believer, I had been happy to let those events come and go. But this year was different. I couldn’t think about baptism without crying. I knew God was calling me back to the water. I didn’t doubt the validity of the first, but my new heart and awakening spirit needed a fresh baptism. At my infant baptism, my parents arranged that I should be wed to Jesus. At my confirmation, I agreed to that future wedding – I gave my own consent. At my second baptism, I was officially betrothed or engaged to Christ. In Jewish tradition, the betrothal referred to the negotiations requisite for the arranging of a marriage which was conducted by members of the two families and usually required the consent of the prospective bride; but when the agreement was entered into, it was definite and binding upon both the groom and the bride, who were considered as man and wife in all legal and religious aspects except that of actual cohabitation. During this time, the bride would prepare herself for her new role as a wife. She would get to know her groom and his family. The groom would prepare their eventual home. Often the groom would pay for the bride in some way. Jesus paid dearly for his bride with his own blood on the cross. This is the time in which I now live. At my death or the coming again of Jesus, I will attend the wedding feast of the Lamb. My Groom, Jesus, will take His bride, the Church, to His Father’s home where He has been preparing a place for us. There we will ever be together. My dear Kiele’s divine romance has just begun. Our Groom has already started growing her up in Him. He will show her His love in a thousand ways. And we, as her family, have pledged to help her recognize His hand and learn His voice. Jesus said that His Father’s house has many rooms. The family of God continues to grow. On that great day, we will be home. What a glorious day that will be. Finding freedom through healthy boundaries. I used to think that having boundaries would make my world smaller and less free. I thought that it would distance me from others and I would have to make difficult decisions. But what I am finding is that boundaries are giving me more freedom and more peace than I thought I could have in stressful situations. Let me explain. It all started a couple of months ago when I “stumbled” on the writings of Brene Brown. You may know her from her wildly famous TED talks on vulnerability and shame. I had seen those talks but never read her books. As the Lord usually does with me, I believe He led me to her work on boundaries to prepare me for a season of conflict He knew I had coming. And a season of conflict it has been. Without going into the details, let me say that there are personal relationships that I have that are requiring me to be strong and make tough decisions. The unprepared me would have been squashed and defeated. Let me share some of the lessons I am learning these days. 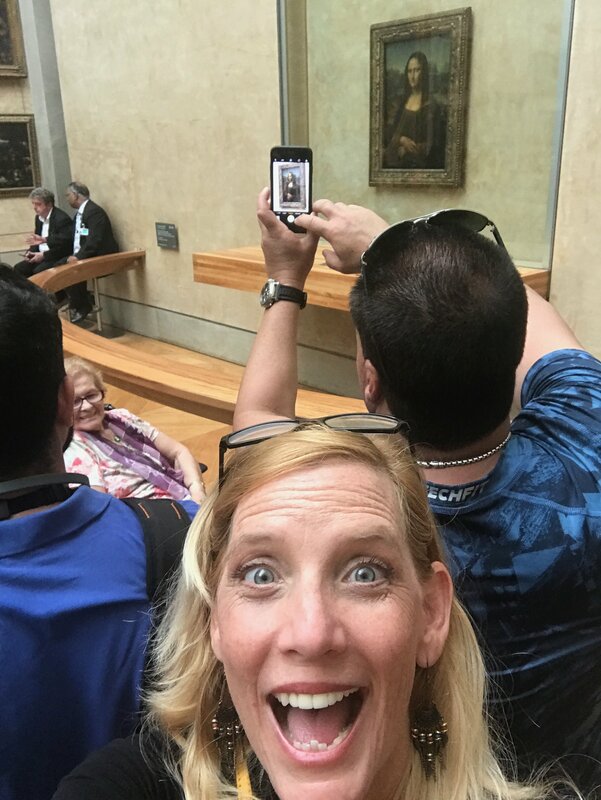 When I was in Paris, I was able to see the Mona Lisa displayed at the Louvre Museum. You can’t get very close to it. It’s not only under glass, but there is more than one rail that keeps the crowd about 10 feet away. Why? The Mona Lisa is valuable. The other paintings of the Louvre don’t get this treatment, and the crowds show it. People walk right by the others, but the crowds around Mona are deep. My life and time are valuable. I deserve a safe boundary. Boundaries help me choose momentary discomfort over lasting resentment. When I realized this, life changed. My old pattern was to let my boundary slide because I didn’t want to hurt or disappoint someone. I believed the lie that the loving thing was to do what they asked. The problem was that I was then stuck with that decision and began to resent either the situation or the person. Yuck! Being okay with an uncomfortable moment (something I’ve learned on my yoga mat), and taking the risk that I might make someone else unhappy has paid off. The funny thing is that it usually is something that doesn’t mean a lot to the other person, but it was putting me out, shifting my priorities, and making my life hard. Often the person was asking me to make their problem my problem. No more. I am no longer willing to work harder on someone’s problem than they are. Firm boundaries in place, I have the freedom to love you with my whole heart. With my boundaries intact I no longer feel resentful or frustrated. My time is spent doing what I choose, not what I have to. When I am there for family and friends, I can be completely engaged. My boundaries also empower others to own their challenges. Our relationship can be one of support and encouragement. Healthy boundaries are good for everyone involved. Keeping my boundaries reminds me not to cross other’s boundaries. Mutual respect is the goal. It hasn’t been an easy road, but I am learning. This season of intense conflict is making me stronger than ever. I can never go back. I have found such freedom, white space, and ease in my days when I practice this. My “to-do” list isn’t weighing me down. Like any practice, the more you do it, the easier it gets! Keeping healthy boundaries communicates worth, promotes peace of mind, and gives freedom to love wholeheartedly. Jesus modeled boundaries perfectly. Look for it as you read through the gospels. Do yourself and your loved ones a favor. Firm boundaries will change your life. I get a lot of great ideas. I suppose it’s the creative part of me that is constantly looking for an outlet. I have ideas about how to get more organized, how to eat better, how to get more sleep, how to end world hunger…you get the idea. The challenge is, I can’t possibly implement all of those ideas, no matter how wonderful they are. So as 2017 begins, I have adopted the phrase, “Less theory, more practice,” as my guide. If I practiced the great ideas I already have, I’d be occupied for the entire year. An idea is a theory. It does no good unless it becomes practice. Practice is the true test of whether an idea is actually great or terrible. An example of this is when as a kid, I thought it would be a hilarious idea to throw my neighbor’s slippers on their roof. When the idea was carried out (the practice), I quickly found out how bad an idea it was, and I had several weeks in my room to think about it. Where this gets serious is when I keep my relationship with God as an idea, and not a practice. I can dream up many ideas about how to set up the perfect quiet time. There is no end to the list of great books I can read on getting closer to the Lord. But an idea of a relationship is not a relationship. Unless I get alone and quiet, focusing on the Lord, there is no practice and I am no closer to Him. If I never learned even one new thing this year about Jesus but put what I know into practice, my life would be radically changed. So how about you? What do you want to move from theory into practice? I have all of these in mind for 2017. Let’s encourage one another this year to be people of action, and not merely good ideas. Our sermon on Sunday was anything but expected. I could tell that our pastor was uneasy as he was coming to a portion of scripture that is not “seeker friendly.” But, thankfully, he is obedient to the Holy Spirit and doesn’t just tickle our ears. He launched in, and I was profoundly blessed. The scripture is found in Matthew 11:20-24. In these four verses, Jesus shows us what it means to walk the narrow road. For someone who tries to live by the “red letters” of Jesus’ words, this passage gives me pause. It separates the followers from the disciples. Which will I be? Then he began to denounce the cities where most of his mighty works had been done because they did not repent. “Woe to you, Chorazin! Woe to you, Bethsaida! For if the mighty works done in you had been done in Tyre and Sidon, they would have repented long ago in sackcloth and ashes. But I tell you, it will be more bearable on the day of judgment for Tyre and Sidon than for you. And you, Capernaum, will you be exalted to heaven? You will be brought down to Hades. For if the mighty works done in you had been done in Sodom, it would have remained until this day. But I tell you that it will be more tolerable on the day of judgment for the land of Sodom than for you.” Mt. 11:20-24. And so there I sat on Sunday, with a full plate of God’s goodness in front of me. Do I squander the incomprehensible blessing of knowing Jesus in this dark world? Does the urgent call of Jesus make me hit the brakes as I head off to destruction? Does the knowledge of God’s grace compel me to live my life differently? So we come to the Advent season. The Light of the World has come. The One who created the universe took on flesh and came became a baby. He lived a human life, experiencing every aspect of living on this planet, yet remained without sin. He became the perfect sacrifice, taking the wrath of God for us, that we might be reconciled to God the Father. He overcame death and lives today. He imparts His Spirit to all who receive Him. May we never become so used to this Truth that we go on about our business, like it never happened. We are the bearers of the Light. Let us not witness this Christmas miracle and remain unchanged. For you are all children of light, children of the day. We are not of the night or of the darkness. So then let us not sleep, as others do, but let us keep awake and be sober… For God has not destined us for wrath, but to obtain salvation through our Lord Jesus Christ, who died for us so that whether we are awake or asleep we might live with him. Therefore encourage one another and build one another up, just as you are doing. – 1 Thessalonians 5:5-7, 9-11. As children of the Light, let us shine, that we may be changed, and the world will find hope this Christmas season. I’ve been reading through 1 Samuel. It’s amazing how no matter where you are reading in scripture, God speaks personally. This book is alive and active. The Israelite army gets nervous. Really nervous. Fear has a way of bringing out irrational behavior. As they wait the 7 days until Samuel arrives, this elite force hides in caves, behind rocks, in thickets, and cisterns. Some even run away. It’s pathetic. Saul begins to feel he’s losing his army (which he is) and takes matters into his own hands. He offers the sacrifices himself in Samuels place. Saul tries to justify his error instead of acknowledging his sin. Don’t misread the word “appointment” in this paraphrase. It was God’s command. Saul sacrificed not because he believed God was worthy of worship, but out of superstition. Saul overstepped his authority and his kingdom comes to an end. This got me thinking. These days, believers in America are filled with fear. We may be tempted to act beyond the “appointment” that God has given. (Your appointment is between you and God. I can’t tell you what it is.) Will we trust that God has a plan? Did Saul, in fear, forget what God did in Gideon’s day? Perhaps a great victory was awaiting Israel with the handful of men that remained. We will never know. Will we stay true to the command God has given us? I have my job, you have yours. It is a difficult thing to rely on each other. Can I trust that you are following God’s leading in your life and not overstep? Living in community is hard, but together, we can carry out the will of God for the benefit of our community in this generation. Saul let his fear dictate his action. Waiting for Samuel was more than he could do. He chose religious activity over his relationship with God. Making the sacrifice looked like the right thing – but it was not and in doing so, he broke a direct command of God. He was the King of Israel, but he wasn’t the priest or prophet. About five years ago, I began searching the scriptures for the offenses of Jesus. (Wait! What? Jesus, offensive? Yes. Here is an introduction that explains the premise.) While teaching, Jesus often used the tactic of offense to reveal the hearts of His listeners. Jesus used it repeatedly to reveal the motives of the Pharisees. But I’ve found an offense that Jesus used to reveal the reason why He came to Earth. He was not engaging the Pharisees, but his own followers. This conversation was not merely a tactic of Jesus to reveal and adjust perception of Him, but in my opinion, the most foundational principle that defines the relationship that each follower will have with Christ. Jesus revealed the very meaning behind His death on the cross. A meaning that his disciples could never have anticipated. The passage is found in John 6. It’s a long chapter, but all parts of the story are so important to the meaning of Jesus’ words. There is a reason that the scholars lumped all these stories into one chapter! The next day, many of the followers (disciples, but not the Twelve) caught up with Jesus at the synagogue. Jesus knew their hearts and minds. They followed because they wanted more free food! (vs. 26) Jesus admonishes them to stop striving for food that perishes but work for the food which lasts for eternity. But they still were not satisfied. They came for the free food. Show us more, Jesus… Moses gave our ancestors manna. What can you give us? At this point, I’m sure that the Twelve are beside themselves. This is not the way to build followers. Jesus is going to drive off all the new people! Jesus assures them that the words He speaks are spirit and life. And no one can come to Him unless it is granted by the Father. Now they must choose. Following Jesus was not going to be a free picnic. Jesus’ followers must come to Him in the manner that only the Father designed. Simon Peter speaks up, “Lord, to whom shall we go? You have the words (message) of eternal life. And we have learned to believe…that You are the Holy One of God, the Christ.” Yes, Jesus words were hard to understand. But one thing Peter knew. His words contained life. There was no one else who could speak that way. They had seen the bread multiplied and picked up the leftovers. They had seen Him walk on water. They had learned to believe. When Jesus’ words are hard to understand, we would do well to learn to believe them. It is a process. Believing involves an intentional cleaving to, trusting, relying on. Remember what Jesus said was the real work of following God? It was to believe in His Messenger! When I trust the One who says the words, I know I can trust the understanding to come in time. Jesus was giving them the secret to eternal life. A life that brought us back from spiritual exile and into a life where Jesus dwells within us. A life reconciled with our Heavenly Father. The very reason He came. In time, the Twelve understood the meaning of these hard and offensive words. They just had to stick around long enough to find out! Are you wrestling with words of Jesus that are hard to understand? Is He asking you to do something that doesn’t make sense? Maybe it’s your assumptions of Jesus that are throwing you off. Get back to the basics of His word. Trust Him. Keep seeking Him. Don’t miss the greater understanding that you will receive in time! My name is Karelin, and I’m starving. If I really admit it, I must say that spiritually, I’m hungry. I know there is more to be had in God, and I want it. It seems that the things that used to satisfy are no longer enough. Can you relate? If you examine your spiritual walk, would you say that there is a general feeling of spiritual lack? In Matthew 5:6, Jesus says, “Blessed are those who hunger and thirst for righteousness, for they shall be filled.” It doesn’t feel like a blessed place to be. I didn’t come to admit this easily. I have spent way too long, trying to cover up my hunger, pretending that I am full. There was a feeling that if I admitted my hunger, I would be letting people down, I wouldn’t be a good example. I’ve come to realize that that was a lie. True humility is being honest about this walk of faith. If Jesus is calling hunger and thirst blessed, why was I acting like I was satisfied. Who was I trying to impress? So I’ve given that up. I am starving. It’s not that Jesus doesn’t satisfy, He does. But like the manna that was provided by God in the wilderness, it is only good for today. Each day, the provision needed to be collected. I’m starving if I am expecting yesterday’s bread to feed me today. Each day has it’s own provision. Each day I come to the Lord to be filled. Each day, that “bread” might look like something entirely new. So what am I hungry for? Righteousness. Righteousness in myself, in others, and in the world where I have influence. I want to see a harvest of souls through Prayerful Breath Yoga. I have one message: Deeper intimacy with Jesus. I’ll share it anywhere I am able – inside and outside the church. One thing I know for sure, if the hungry insist that they are full, there will be no provision of bread. If the thirsty pretend they are satisfied, there will be no downpour of water. It is the barren that miraculously conceive. If your heart breaks for the lost, will you join with me? Let our “prayerful breath” plead for the lost of our community, and for revival in the Church. Prayer is the place to start. There are many “big” questions in life. One I’ve been wrestling with lately is, “Who am I?” In the grand scheme of things, this is one that speaks to the core of my existence. Over the years, I have tried to answer that question in several ways. The first way I’ve answered it is, “I am what I do.” I’ve told myself that I am a daughter, a wife, a student, a mother, a lover of chickens… The list can go on and on. But when I answer the question this way, I ride the ups and downs of how I think I’m doing at each of these descriptions. The days when I am patient with my kids, I feel great. But then there are other days, the one where I forget to buy milk or leave my laundry in the wash overnight. Fail. Down goes my mood and my outlook on who I am. These are light examples, but I’m sure you get my point. I can really blow it. What I do is not a reliable indicator of who I am. So I’ve answered it this way, “I am what others say about me.” This is great when others are kind, or don’t see all of me… But it can be devastating when people judge me or speak to me out of their own pain. Relying on others to tell me who I am is a dangerous and hurtful way to frame who I am. I don’t recommend it. Another way to approach the question of who I am is, “I am what I have.” It’s tempting to think that the accumulations of my life make me who I am. I am my stuff – or even my lack of stuff. (There is no inherent virtue in minimalism…) This doesn’t have to be material. I can come to believe that I am my education, or my citizenship, or even my socio-economic class. When I base my identity on things, and the things disappear, what is left of me? Slippery slope indeed. So how do I answer this fundamental question? I turn to God and His Word. In the gospels, Jesus’ identity is revealed at the moment of His baptism. John the Baptist, takes Jesus under the water, and as He rises up, a dove descends and a voice from heaven speaks. “This is My Son, the Beloved, on whom my favor rests.” (Matthew 3) The voice does not make a list of all Jesus has done or is going to do. God doesn’t list the traits that his family or friends have said he is. The voice does not even declare that Jesus is the Messiah. It simply states that Jesus is the Beloved of God, his heavenly Father. That same love is mine! Jesus says in John 15:9, “As the Father has loved me, so I have loved you; abide in my love.” I have been given the same standing that Jesus has. I have been adopted into God’s family and am God’s child. I too, am the Beloved! That is my identity. It is the only one that will sustain me through the ups and downs of life. That fact never changes because it does not depend on me at all. God loves me. Period. He loves me when I’m good, bad, rich, poor, achieving, or failing. Because He loves me, I am the Beloved. So how does this truth play out in my life? The fact that I am the Beloved saves me from the traps of success, popularity, and power. Those are indeed temptations, but the greatest trap in life is that of self-rejection. When I doubt who I am I lack confidence and put myself down, or I can swell with pride to convince others of my worth. In Henri Nouwen’s book, Spiritual Direction, he writes, “Self-rejection is the greatest enemy of the spiritual life because it contradicts the sacred voice that declares we are loved.” The sacred voice. How I long to hear it. Get the latest class/event updates!